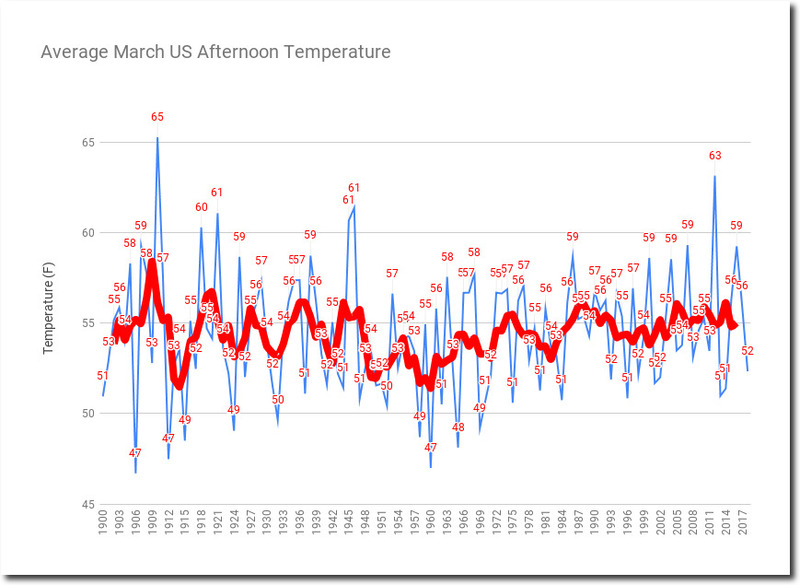 Same story with 85 degree March days – they used to be relatively common, but rarely happen any more. 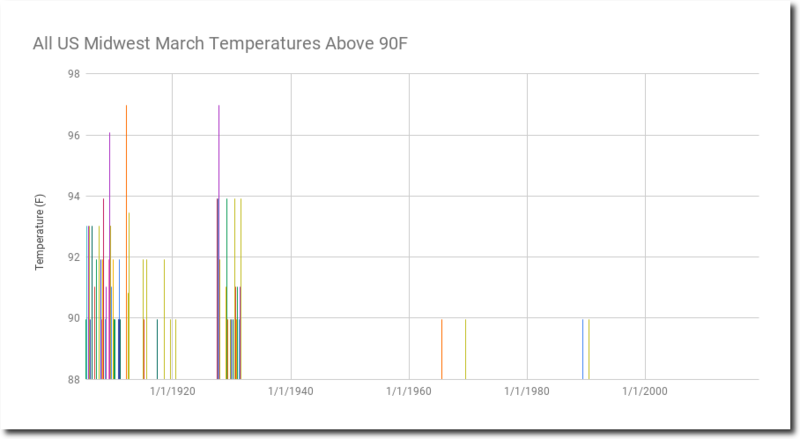 The table below shows the dates when March ninety degree temperatures were recorded. 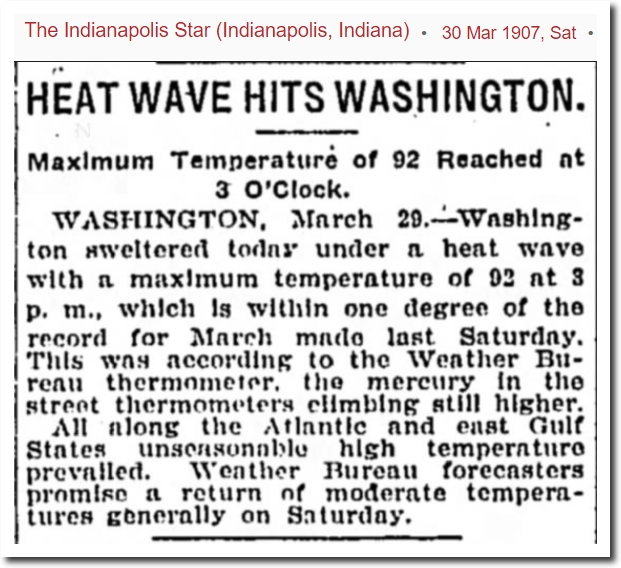 Note that the Midwest had 90 degree temperatures on eight consecutive days from March 19, 1907 to March 26, 1907. On March 24, 1907 there was an ice cream shortage due to the heat, and people blamed the heat on a comet. 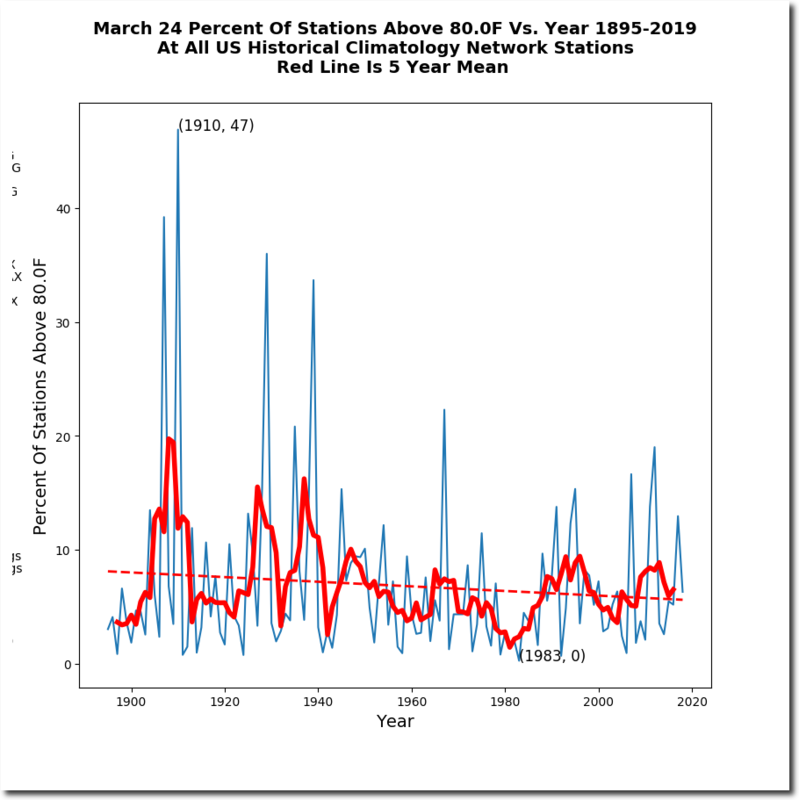 The East coast was also having a record heatwave, and people blamed the heat on sunspots. 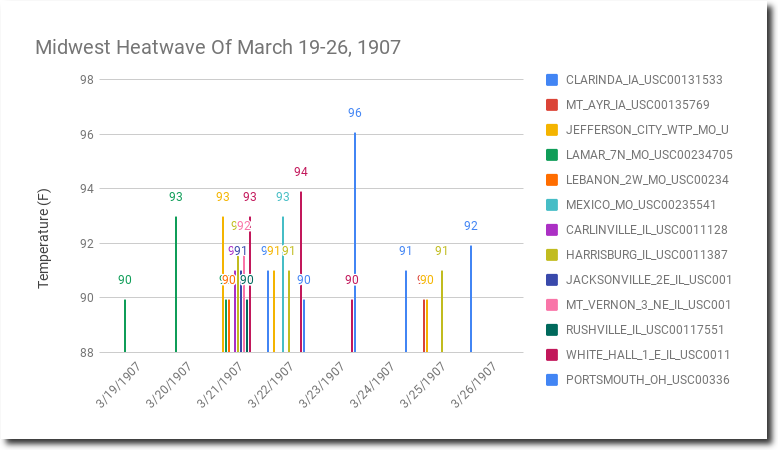 The warmest March in the US occurred in 1910. 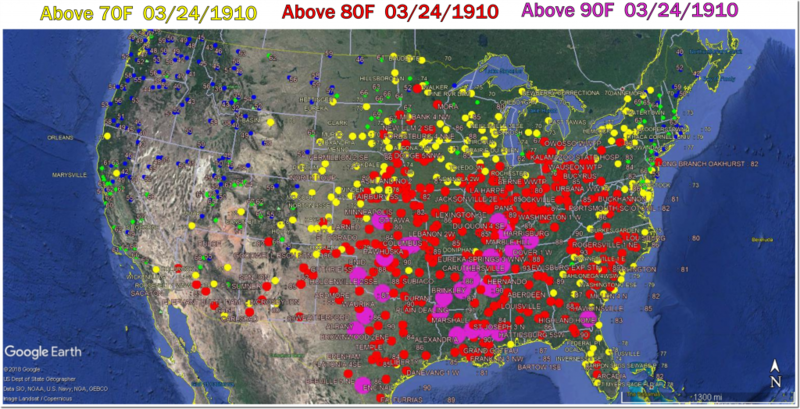 On March 24, 1910 the average maximum temperature across the US was 74 degrees, and nearly half of the US was above 80 degrees. Heat like this is inconceivable now, but if it did happen climate experts would declare 99% certainty it was caused by CO2. So much for climate “experts”. These historical notes are very interesting. Some soda fountains would have had refrigeration in the early 1900’s but homes did not. Ice had to be delivered to refill one’s ice box regularly. People died at higher rates from consuming spoiled food back then. Ice cream wasn’t sold in super markets until the late 1930s. Refrigeration mostly used toxic gases such as ammonia and sulfur dioxide and leaks were often deadly. Freons were safe and made wide-spread refrigeration possible, along with electrification. Soda fountains advertised the sale of phosphates back then. Can you imagine that today, though soft drinks still contain phosphoric acid? When was the last time you saw a pharmacy with a counter that served food and drinks? They are coming back within big box stores and supermarkets. Been a long time since I saw you use the yo yo article Tony. 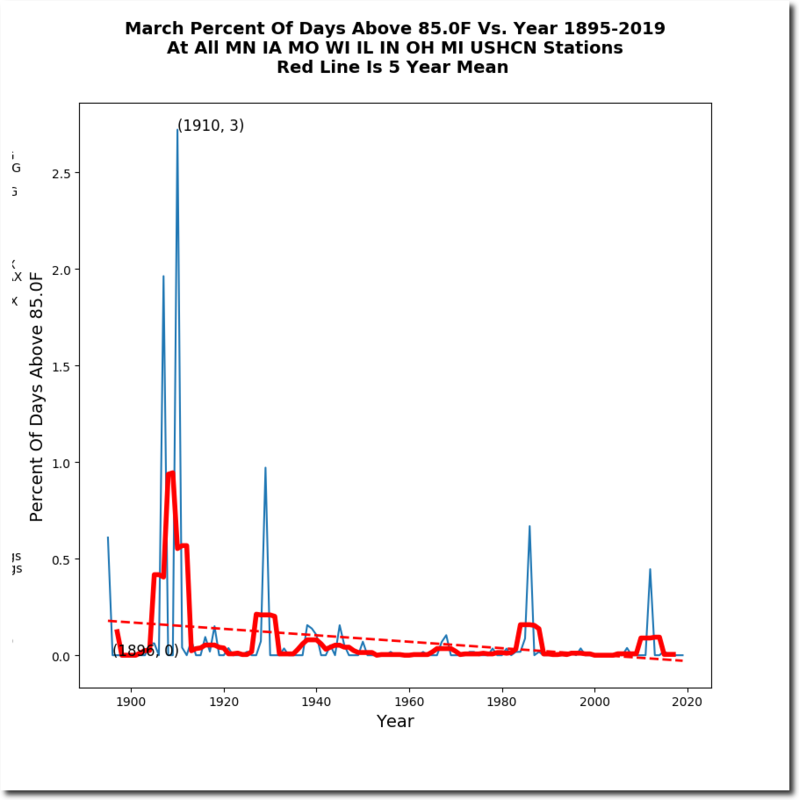 How will the warmists spin this story of flooding in Nebraska? Now their computer models say CO2 drove the ice ages. Not surprised. As a side note, whenever anyone says “carbon” when they ought to say “CO2”, I just stop listening to anything else that comes out of their mouth. What utter drivel from these fools. Looking at the record, there’s a regular 100,000 year pattern to ice ages, which can’t be caused by tectonics. In other words, they’re telling us that continents crash together regularly every 100kyr. 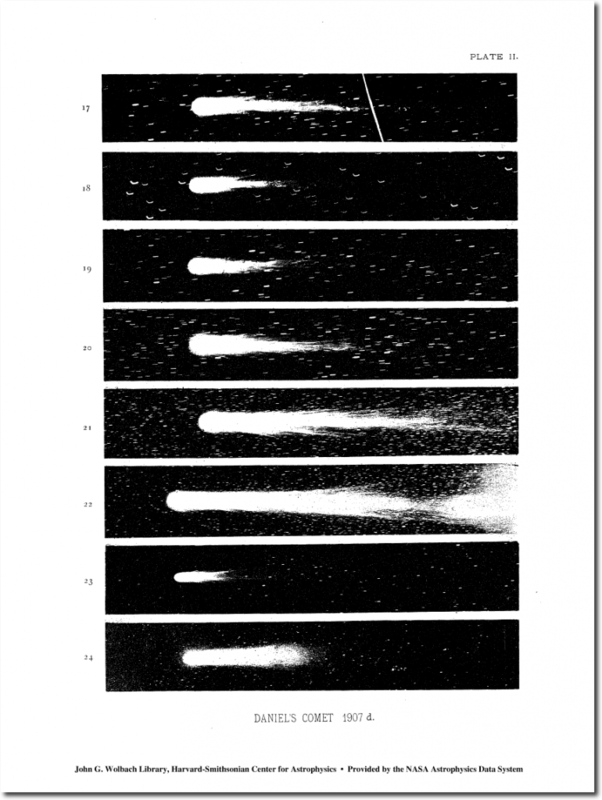 Milankovitch cycles would be responsible. They’re desperate to link CO2 to everything possible. What an amazing molecule. 1910 was the year of the Big Burn (aka Great Fire of 1910; its Wikipedia name). Numbers in brackets are the Wikipedia sources. 1 & 2 follow from Timothy Egan’s book and NPR stuff. 9 is a NOAA report for Idaho. A few years ago the over paid (being paid at all) Climate Commissioner in Ms Gillard’s socialist alliance (Labor) government stated that Sydney dams would run dry any moment now. It has been raining heavily (again) for the last week, with another week predicted by the BoM (if that org can be trusted). I digress. All those historical clippings Mr Heller are just that, historical. Everybody knows history is white man subjective and therefore would be wrong. The latest end-of-times scares are modern computer models (SISO) and therefore much more reliable. Only eleven years to go ’til the end of the planet, again. I often wonder how New York is going under water. Hey nfw! Yes, the CAGW crisis is like nothing ever encountered before. Perhaps the best part about today’s computer modeling is that they will be able to tell us that the planet has been destroyed and that we are all dead before we even realize it. We will be going along, believing (falsely!) that we are having a normal day, living our lives, major cities still above water, completely unable to recognize that we have been utterly destroyed and passed into a walking illusion of health and happiness. Oceans will be boiling and all we will be thinking is “who wants cake?” Only by sophisticated computer models will we be educated on our TRUE state of mayhem and catastrophe! Speaking seriously, during a plague, a flood or a major earthquake, no one ever seems to argue that, “no one is sick!”, “my house didn’t float away!” or “Earthquake? That was just a passing heavy truck rumbling along the road!” On the other hand, CAGW is the world’s first global catastrophe which is so very subtle that it’s supporters are forced to use obscure and logically questionable statistical techniques in their attempts to establish ts existence. Imagine, a global catastrophe so imminent, so world-spanning, and so overwhelming that people need to have assistance just to notice it! Ha! Even then most don’t notice it, or at least don’t give a damn! 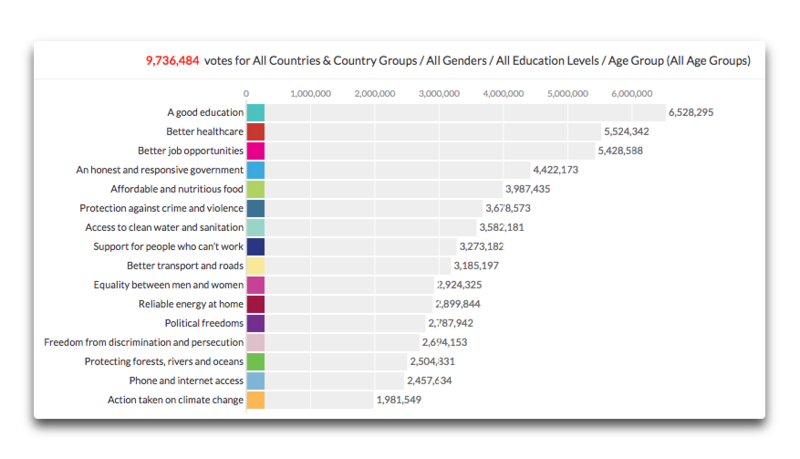 Adults have far more important and pressing concerns. Which is where it belongs… As you say, most adults are far more concerned with REAL problems that actually have noticeable effects on actual lives. The worst part of the CAGW scam is that it drains resources from being used to mitigate environmental problems that do, in fact, exist. Agricultural runoff, over fishing, aquifer depletion, top soil exhaustion, etc., are all worth paying more attention to. Instead, we see billions of dollars spent on fighting an imaginary enemy. Hey Jason! 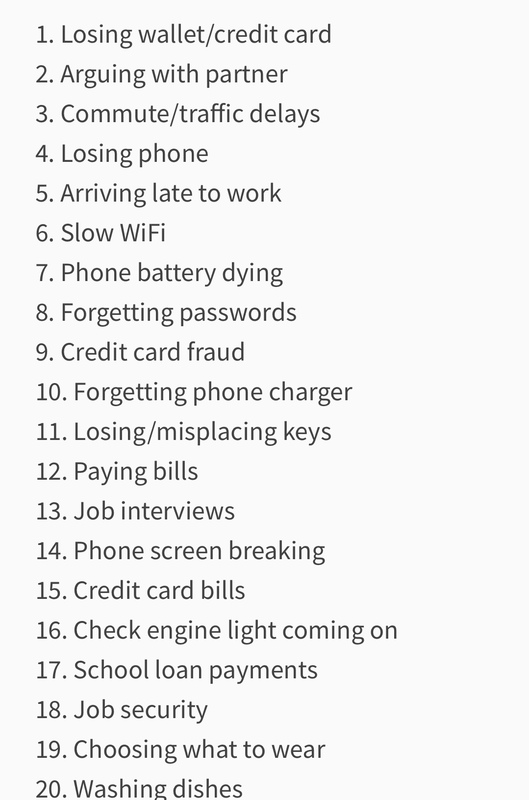 A new “study” was just released, and it lists the top 20 items stressing out millennials. Climate change did not make the list, and was beat out by “choosing what to wear” and “washing dishes”. Not even the endangered snowflakes are worried about global warming. Nobody but the fringe loonies even care anymore. The grantologists and fascists know there is not a threat to the planet, and they are simply pursuing their agendas. It is amazing that none of those heat records were attained by means of jet exhaust, AC exhaust, blacktop and concrete. 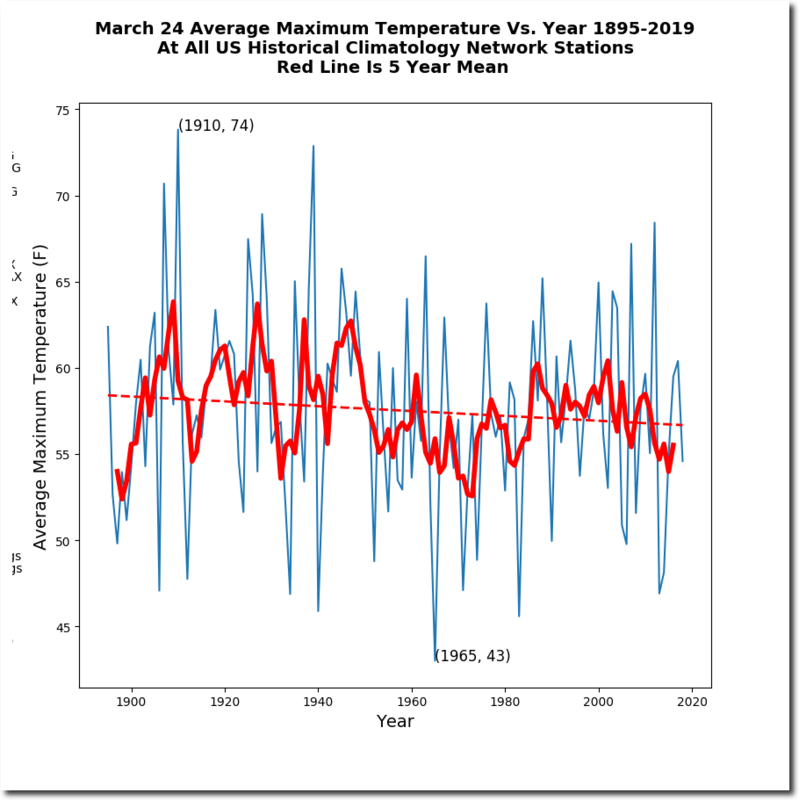 Plus a whole hoard of dutiful NOAA employees seeking any way possible to warm bias the readings (cheat) in order to “prove” global warming.